Florida Keys and Key West, Dining and Restaurant Guide Dining and cooking videos, repipes, hotel videos, restaurant videos, menus, tourist maps, beaches, brochures, discount coupons. KEY LARGO Key Largo, located at the top of The Florida Keys offers excellant, friendly, waterfront dining on both on the Atlantic Ocean and bayside. Most Key Largo restaurants serve fresh, local, Florida Keys seafood, beef, salads, pastas and much more. Choose from extensive appetizers, and exotic entre's like sushi and diverse ethnic as well as fabulous tropical deserts. Many Key Largo restaurants offer homemade chowders and raw bars. Additionally, most Key Largo reataurants provide a children's menus. Those who are into Florida Keys fishing or diving can feel comfortable bringing their catch along and asking the chef prepare it for you. Be sure to watch the Florida Keys dining video about Key Largo for more tourist and vacation information! Islamorada Known as the sports fishing capitol of the world, Islamorada also has a repuation for fine dining. Here in Islamorada you can sample everything from wonderful fresh baked breakfast pasteries and croissants to seven course dinners. Many of the finer Islamorada restaurants feature various cuts of beef, lamb, chicken, pork and of course fresh Florda Keys seafood. Some even boast Brazilian sausage and will carve them at the table for guests> There is a large Islamorada local community in The Florida Keys who favor the Islamorada restaurants and diners that feature Tuna Nachos, BBQ shrimp, and spicy tuna rolls, just to name a few. You can always find a wide assortment of Florida Keys entertainment at these places and many provide breath taking Islamorada sunset views during happy hour. Be sure to watch the Florida Keys dining video about Islamorada for more tourist and vacation information! Marathon Located in the middle of the Florida Keys, Marathon is the perfect place for family fun. The Marathon restaurants here range from small place that are off the beaten path to five star restaurants in the resorts and spas. Florida Keys Tiki Huts and Tiki Bars are very popular in Marathon and a very popular spot for tourists is the famous Seven Mile Grill located steps away from th 7 mile bridge. This Marathon locale was made famous from the scene in the movie True Lies. All dining in Marathon as well as throughout the Florida Keys and Key West is casual. Great Florida Keys atmosphere and friendly staffs making dining in Marathon a treat to remember. Be sure to watch the Florida Keys dining video about Marathon for more tourist and vacation information! Big Pine The Old Florida Keys is the best way to describe Big Pine. Made up of multiple Flordia Keys islands, Big Pine is host to the endangered Florida Key Deer. Though not much larger than a large dog, Florida Key deer are friendly to humans and will never be found on the menu. However, just off shore from Big Pine is the world famous resort, Little Palm Island. Here you will be treated to spectaular Florida Keys dining and live entertainment nightly. Yachts from all over the world make a stop at Little Palm Island Resort and Spa as well as celebraties who wish to maintain their annonimity. Big Pine is also host to a funky little place called No Name Pub. Here you can order pitchers of cold beer and pizzas to die for. In addition to a great dining experience, the deor is a showstopper. Almost every squqre inch of interior surfance has been covered by prior patrons with United States dollar bills! Be sure to watch the Florida Keys dining video about Big Pine for more tourist and vacation information! Key West Lastly, but certainly not least on the Florida Keys Island chain is Key West. US-1 mile marker zeo, the end of the road and the southernmost city in the contental United States. Key West is closer to Havana, Cuba than it is to Miami, Florida. Hence, much of the food here in Key West has a distinctive Caribbean Island flavor. In fact, years ago, the birthplace of Pan American World Airways was located in Key West. Now the Key West building is the famous Kelly's Caribbean Grill and Brewery. The name Kelly comes from it's original Key West native owner, Top Gun's legendary leading Key West lady Kelly McGillis! Key West Dining is spectacular. There are a burgeoning number to choose from and you can be guaranteed to find whatever type you desire. Fresh Florida Keys seafood tops the list, and Key West Pinks, the famous local shrimp, are king. In addition to Florida Keys restaurants, Key West has some of the finest bars with nightly live musical entertainment. In fact, every year, the SongWriters Festival is held in Key West. Songwriters of all genres converge here to Key West to share songs and stories and also perform! What could be better than to be in The Florida Keys paradise, sipping a cold one and eating jumbo Key West Pink shrimp while listening to live Florida Keys music performed under the Key West stars by world renowned muscians? Be sure to watch the Florida Keys dining video about Key West for more tourist and vacation information! Additional Information about The Florida Keys and Key West Dining Conch Republic Dining is committed to promoting tourism and quality dining in The Florida Keys and Key West through videos shot in High Definition video and streaming live over the internet. In entertaining short video episodes, Conch Republic Dining shows you the newest and most exclusive restaurants that The Florida Keys Key West have to offer, always free and on demand. Our expert travel hosts take you behind the scenes for a look and taste of The Conch Republic lifestyle and the people who define it. 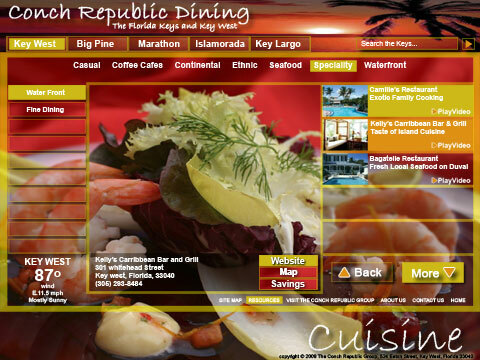 Don't forget to log in to www.ConchRepublicDining.com every day and stay up-to-date on our most recent video segments and dining news. All programming is thoroughly scouted by our experts in Florida Keys and Key West travel to ensure that Conch Republic Dining brings you only the finest Florida Keys and Key West restaurants, chefs, services and trends. The Florida Keys and Key West, we're flip flop friendly!